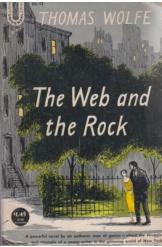 The Web and the Rock by Thomas Wolfe, English Prose. Smalltown southerner George Webber flees to New York City, "the rock," in search of a new life. The novel chronicles his search for employment, for love, and ultimately for purpose. Book is in good condition, all pages intact.